3 West Club - 3 West 51st. St.
Ameritania at Times Square - 230 W. 54th St.
Chelsea Pines Inn - 317 West 14th St. Comfort Inn Central Park West - 31 West 71st St. 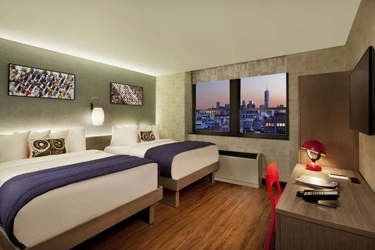 Comfort Inn Manhattan - 42 W. 35th St.
Dylan Hotel - 52 E. 41st St.
Excelsior Hotel - 45 West 81st St.
Hotel 32 32 - 32 East 32nd St.
Hotel Belleclaire - 250 West 77th St.
Hotel Edison - 228 West 47th St. Intercontinental Times Square - 300 West 44th St.
Murray Hill East Hotel - 149 E. 39th St.
Riverside Tower Hotel - 80 Riverside Dr. The Evelyn (formerly The Gershwin Hotel) - 7 East 27th st. The Marmara Manhattan - 301 E 94th St. The Roger Smith - 501 Lexington Ave. The Time Hotel - 224 W. 49th St.
Wellington Hotel - 871 Seventh Ave. @ 55th St.
Wyndham Midtown 45 - 205 East 45th St.